Table is one of the component type available for dashboard. 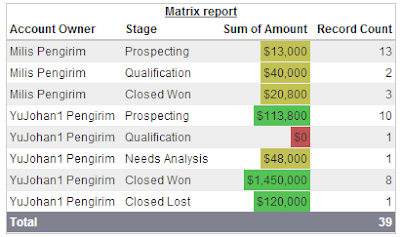 By default, tables show only two columns of data, but you can modify it up to 4 columns of data. You can also personalize the table and show users’ Chatter photos as long as the table doesn’t have more than 20 rows. The first grouping in the report (not in chart) becomes the first column of the table. Use vertical bar chart in the report to make more fields available for the table. 1. 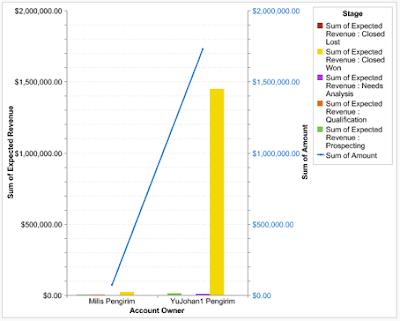 Customized tables will allow null values in the results. 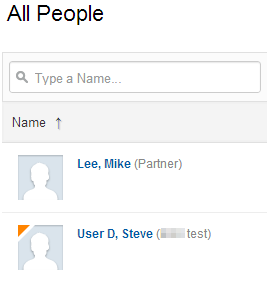 The Default two-column tables do not. 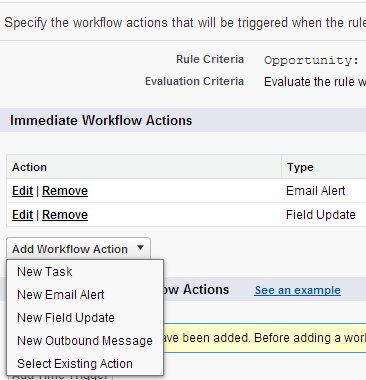 But, if you realize (until release Summer '14 release) for workflow object Event and Task, there is NO Email Alert option for action. And this screenshot on Event or Task, notice that "New Email Alert" is not there. This limitation has aware for quite long time, and someone has posted this in IdeaExchange, you are please to vote from here (currently it have 2670 points for this idea). This option may not be a nice, it will create another new task just to email user when Workflow on Task or Event triggered. 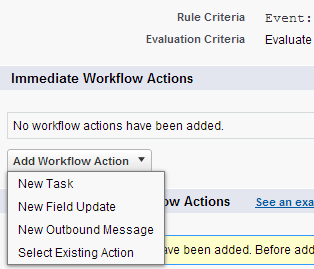 You need to tick Notify Assignee in the task for Workflow. Here a sample code for this. 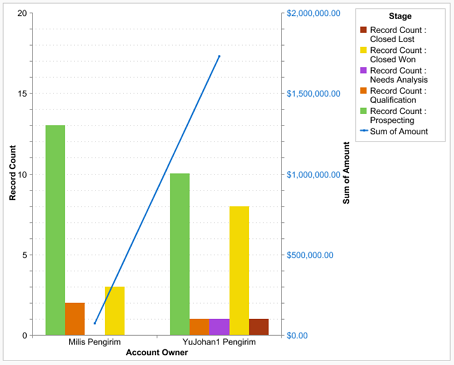 To change Account Type from Prospect to Customer via a button click, and Customer value itself maybe not a picklist in the account type. 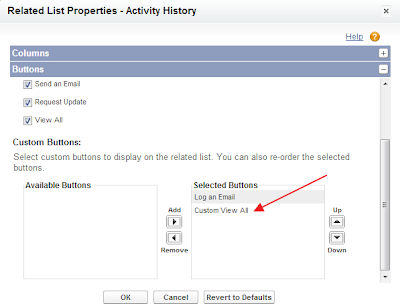 Add custom button created to the Account page layout. Further tweak, you also can differentiate Customer record type with Prospect record type, so in the script above, add one line to change Account Record Type with Customer Record Type Id, then assign different Page Layout for Customer. Last month we wrote a blog of using LAST_WEEK ; LAST_N_DAYS:n ; N_DAYS_AGO:n for SOQL query, it is simple and very powerful to query Salesforce data dynamically. 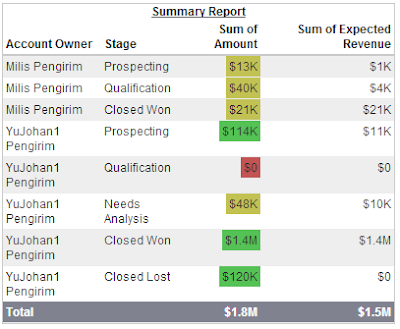 The same we can implement for report and view. This blog will discuss using Relative Date Value, such as: Yesterday, Today, Tomorrow, This Week, Last Week, etc (for complete value, refer to this Salesforce documentation) in report and how to choose date value to use. We'll use Last n Months versus Last n Days for sample. VP of IT would like to understand users not login to Salesforce in last 60 days. Using Salesforce report, we can easily create a report, by selecting Users report type (make sure you have admin privileges). Add a filter in the report Last Login not equal to LAST 60 DAYS and done. This report will show all users never login + users not login within last 60 days. If you tweak the filter to Last Login not equal to LAST 2 MONTHS, surprisingly you will get very different result. Using "not equal to LAST 2 MONTHS", will show users never login + users last login = Dec '13, because last 2 months in this scenario is Oct '13 & Nov '13. Using "not equal to Last 60 DAYS", will return users never login + users login before 27 Oct '13. Make sense? Hope this help. Can we sort Salesforce Activity History? 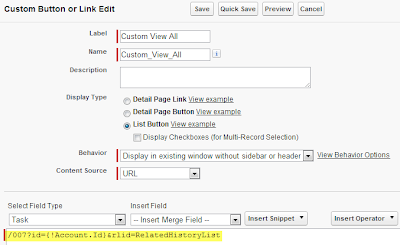 Until Summer '14 release, users cannot sort related list manually (including Activity History), and admin also not able to change the default sort. Activity History is always sorted by Due Date (or ActivityDate in API name) in descending order. It will not consider the created date or modified date in the sort order. Then, we edit item 2 and 3, we change the Due Date for item 2 to 8/23 and item 3 to 8/25, it will be re-sort with Due Date desc. Edit the Layout, scroll to Related Lists and look for Activity History. 3. Save the Page Layout and Done. 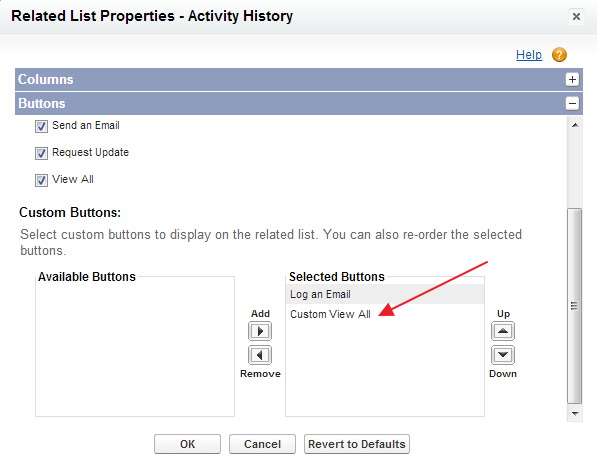 User will see a new button added to 'Activity History' related list. 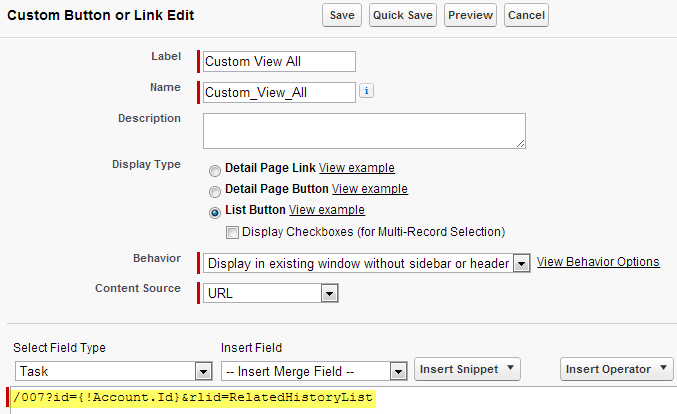 When the user click the button, it will open a new page where the user will be able to sort by any fields. In Winter '15 release, Salesforce introduce sorting Activity History by Last Modified Date in ascending order, but caused some inconsistency and this has been reverted the changes made in Winter 15. Is it possible to deploy Profile using Change Set? As of now (Summer '16) release, you cannot deploy Profile as stand alone component in Change Set. But, you can include Profiles in the Change Set. What this mean? Components setting (such as: custom field, custom object, etc) related to Profile will be deployed correctly for that Profile, but bear in mind that it also will deploy profile setting for Administrative Permissions, General User Permissions, Login Hours, Login IP Ranges for the profiles. 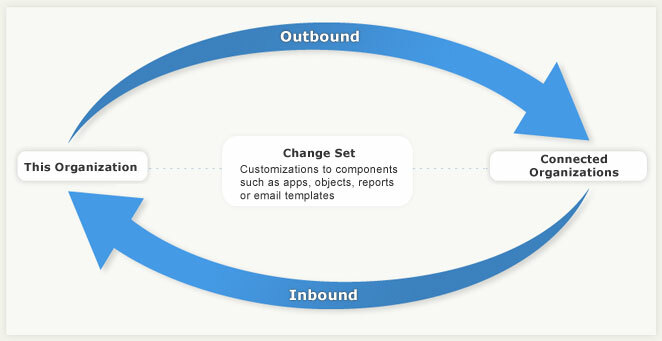 My experience in deploying Profile with Change Set is still very challenging (even we know Salesforce is keep enhance it). As Profile is not a Change Set component, it will not allow you to upload just Profile. So, if you want to deploy Profile, the workaround is to add a component to the Change Set, such as: custom field or others, then include the profile in Profile Settings For Included Components. 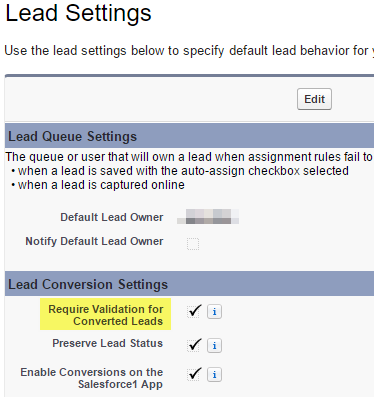 Below settings in Profile need be configure manually in target organization after change set deployed, if the corresponding components are not deployed in the same change set, example: you have a custom object called Invoice and profile called Sales, let's say Sales profile have Read, Create, Edit access to Invoice in source org., but if Sales profile is not included in the change set, Sales profile users will have no access to the Invoice object. Profile not exist in target organization will be create, while existing profile will be overwritten (if the related components is in the change set). If you have a profile has been deleted in target instance, and you deploy Change Set with the same Profile name, deleted profile will be restored with all permissions before it is deleted. Why didn't our change set deploy field level security settings? 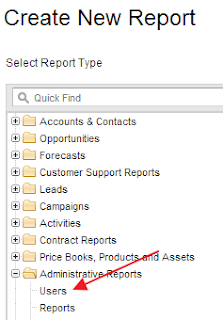 Do you realize that attachments on a Task or Event that is related to an Account, Contact, or Opportunity, will roll-up to appear in the Notes & Attachments related list on the Account record. But, they do not appear in in the Notes & Attachments for Contact or Opportunity, is this something weird? And the worst, this is not customizeable and even to customize the related list for Notes & Attachments. See this document related to this in Salesforce knowledge.